Feel comfort and secure while access to Village. Get the bonus - no traffic jams. RFID equipment: reader and antenna in hard case with high level of water resistance. Also all components of RFID system looks perfectly well. By the way, all types of plastic resistant to UV rays therefore our antennas are like new for many years! Software for online administration / configuration (cloud system with remote access VIA web-browser). SDK / API interface for customer’s software integration including billing and accounting systems. Demo kit of RFID-transponders / RFID-tags for easy and fast start of RFID system. All tags were written to system and ready to use. Optional – integration with existing access controllers via Wiegand interface with ability to determine the vehicle’s movement direction. You can choose Wiegand 26 or 34 or any other version of Wiegand. RFID systems ESMART has been specifically designed for non-contact access of vehicles to the territory. there will be no more traffic jams in the morning or evening – gates will be opened immediately after tag appears (near it) near them. It is very comfortable for cottege complexe’s "sitizens" to use tags. The most popular type of RFID-tags is RFID-label to stick it on the windshield of the car. After you stick it on the windshield it is impossible to remove it without destroying. The second one – is RFID-card, it looks like simple bank / credit card. This tag could be given to another driver. Also it is possible to choose different types of RFID-tags including RFID-tags for outside mount and RFID-sticker for rearview mirror. Depending on the system settings, customer's desire and configuration of the checkpoint, the RFID-tag can be determined at long distance up to 15 meters. If a tag is found, the system checks the access rights to the territory. If rules coresspond with access rights to territory, the system opens barrier or gates automatically. RFID system can control any kind of gates or barrier with motor driver – the most simple way is to connect RFID-system by parallel to push-button of standard keyfob controller. Car-Access system ESMART – for barrier control in large Cottages village. Superior soluton to work in really big cottage villages with large traffic. Based on FEIG Electronic reader. Car-Access system ESMART – for barrier control in middle and small Cottages village. Advanced solution for comfort contactless access. Car-Access system ESMART – for gates control for private Cottage. Car-Access system ESMART – for barrier control in Townhouses village. Standard solution. Car-Access system ESMART – for gates control in private house or barrier control in simple village. Budget solution. Identification of vehicles is carried out by passive RFID tags (transponders) operating under the standard protocol UHF EPC Class 1 Gen 2 (860-960 MHz). RFID-tags don’t have embedded batteries or any other kind of power supply. Therefore it is no need to make maintenance. In winter, the label will work as well as in the summer. You will only glue RFID-label to windshield of a car and will use it for years without any problems.The transponder is glued to the inside of the windscreen for best readability, in some car brands on windshields, a special place for marking is provided. We would like to make notice that RFID System is suited to standards and sanitary requirements to radio frequency systems – usage of RFID is completely safety. The power of RFID radiation is looks like mobile phone radiation, by the way – everybody uses phone for years. Contactless monitoring for reasons of accounting and billing. Also it could be easily used not only for Cottages, but for: small factories, yards of cities, office territories, garages, vehicle bases, hospitals, schools and universities. The system is ready to use just install it and connect to barrier. The system could be Stand alone or work under host-control or to provide some information to host (to IT-system). It supplies any kind of barrier and gates with motor. The system adapted to be installed outdoor and indoor. The system is suitable to any kind of climatic zones. Attention! The long range RFID-reader is the core of the system. Therefore, you have to pay attention some features in installation, including antenna orientation and RF-power limitation. It should be done at time of installations in real situation. Reading on long distance sometimes is not so good as you can think, sometimes you have to reduce the distance of reading RFID-tag to avoid scanning when you don’t need it. Sometimes to avoid it you have to move antenna left-right or up-down. 1) The best situation of scanning RFID-label for windshield. It is the longest distance of reading – up to 15 meters, sometimes could be more. Distance depends of windshield glass, of angle of windshield, of existing heater of anti-radiation sun foil embedded to windshield. 2) If you would like to use RFID system ESMART with RFID-cards you have to know that distance is significantly less then with RFID-label for windshield. It will be only up to 5 meters, maximum. When you will prepare an installation project, please pay attention, that the best way when you use RFID-cards - is to install RFID antenna not at front of car, but near the car from left r right door. At this position of RFID-antenna you have to show RFID-card to the left or right window, but still without opening its, and no need to go out from car to scan the card, it could be visible up to 4/5 meters. It is still very comfortable. At the basis of system is used RFID with frequencies of UHF frequency band, means 860-960 MHz We can configure it for every country by using country’s internal Radio Regulation recommendations. Near checkpoint of territory, means near gates or barriers, you have to install RFID-antennas with using our mounting sets which allows to change an angle of antenna to make the best orientation for RFID-tag visibility. 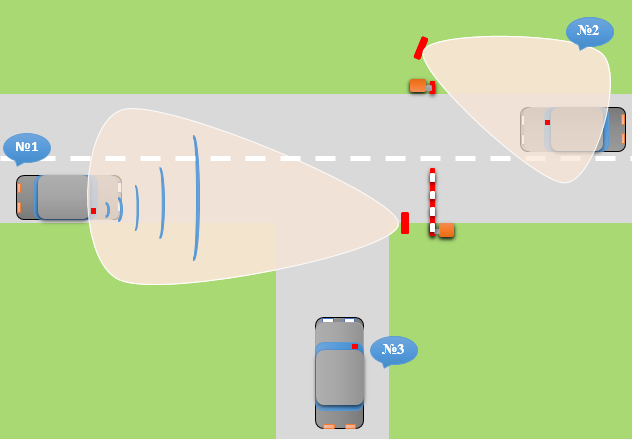 RFID antennas should be oriented directly to potential zone, where car will appear. As soon the tag is antenna field, the system will open a barrier automatically. One system can manage up to 4 antennas at one time, so you could manage 4 barriers. Identification distance could be up to 15 meters. For the most amount of car it is 10 meters. When an RFID tag is glued to the windshield, the equipment responds "on the go." The identification range is up to 15 meters *. In the case of using a mark made in the form of a pass, it is necessary to stop at the passage and show the pass towards the antenna. The identification range is up to 4 meters *. Напряжение питания 220 Вольт AC. Опционально возможно напряжение питания 12 VDC или 24 VDC с внешнего источника напряжения. Нагреватель в составе шкафа электромонтажного 45 Вт (питание 220 В AC). Термореле с регулировкой температуры включения обогрева. Встренные реле для коммутации напряжения до 65 Вольт DC с током до 2 А, 4 шт. (управление шлагбаумом, светофором, светодиодной индикацией и пр.). Гермовводы IP54 (для подключения питания 220 Вольт, кабеля управления воротами и пр). Программное обеспечение (ПО) собственной разработки ISBC уже установлено и настроено. Тестовые RFID метки (5 шт) для отладки системы поставляются в комплекте и уже внесены в ПО. Настройка RFID модуля: включение и отключение RFID антенн, регулировка мощности RFID тракта, что позволяет регулировать дальность чтения меток. Настройка распознавания меток "свой чужой", защита от подделок и клонирования меток. Редактирование таблицы доступа, то есть автомобиль сопоставляется с номером метки. Задается ФИО владельца, информация о машине и комментарии (например, номер участка и пр.). ПО имеет WEB интерфейс, доступный с любого устройства (ПК, ноутбук, смартфон, планшет). Доступ к WEB интерфейсу предоставляется по паролю. ПО разработано ISBC. Базовая функциональность ПО обеспечивает работу системы автономно, то есть без необходимости подключения к каким-либо сторонним системам (без управления компьютером). Если необходио изменение или расширение функциональности системы, интеграция со сторонними системами (например, 1С, СКУД) пожалуйста, обращайтесь к менеджерам ISBC-RFID, мы обязательно Вам поможем.